We’ve made a big improvement to our video player today. Videos are now streamed in the best quality level for your current Internet connection. Previously, if you bought a video course from the Soundslice store or uploaded a video to our servers when creating a slice, we’d always stream you the same video, regardless of your connection speed. This meant that people on slow connections would often need to wait for buffering. And people on fast connections wouldn’t realize the full potential of their connection, because our videos were encoded in a “medium” quality level to balance the needs of all our customers. Now, we’ll serve you the most appropriate quality level based on your current connection. From spotty cell phone service to a high-performance desktop connection, you should get the best possible quality for your situation. If you hover your cursor over a video in our player, you’ll now see a gear icon that lets you toggle the quality level. 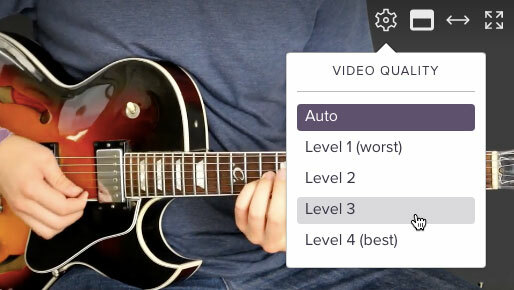 By default, we use an “Auto” setting, which automatically increases/decreases the video quality based on your connection in real time. You can also manually specify a quality level, if you’d like to force the issue (for example, to save your bandwidth or explicitly request high-res video). If you don’t see the gear icon for a video, that means the particular video hasn’t been activated for adaptive streaming. While we’ve activated this for all the videos in our store, we’ll be rolling it out to all user-uploaded videos over the coming days. All videos using our Vimeo and Wistia integration have this activated immediately. For videos you’ve uploaded directly to Soundslice: all new videos going forward have this automatically, and legacy videos will be converted over the coming days.